Guy Fieri, the food personality who spikes his hair with french fry oil, has a new-ish restaurant, Guy's American Kitchen and Bar in Times Square, that was brutally eviscerated by food reviewers. That's probably not good when you're trying to launch a restaurant. What's also not good is forgetting to lock down the website domain of your restaurant's name. 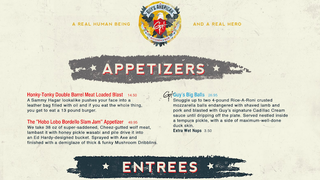 Apparently, somebody bought the rights to Guysamericankitchenandbar.com and posted a fake menu that's sure to excite all of Middle America. This is the mastery of the entire Internet, folks. You can search far and wide and all around the belly of Guy Fieri and it doesn't get any better than this. The site design is definitely believable and the menu is so insane that it feels right in line with something Guy Fieri would want to eat. Included as options: a 13 pound burger, peach and ether glazed Marlboro Light, Cinnabon add-ons and flavors upon ounces upon pounds upon flavors upon sauce. Guy Fieri has become a caricature of a Guy Fieri caricature that everything actually looks like it belongs on his real website (which can be found at Guysamerican.com). The great man who did this for the Internet's pleasure is programmer Bryan Mytko. Wonderful stuff. We should eat at Guy's together and ask for the Superbowl Bash Bro'det.